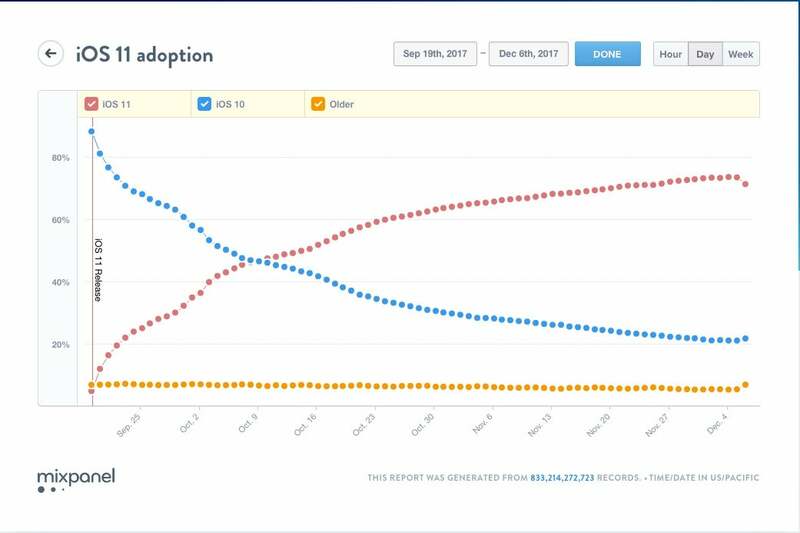 On Nov. 8, 2017, less than two months after its Sept. 19 release, iOS 11 had achieved just over a 50% adoption rate, according to Apple's App Store support webpage for developers. Today, the company said that number has grown to 59%, with iOS 10 dropping to 33% and all earlier versions of iOS running on just 8% of devices. 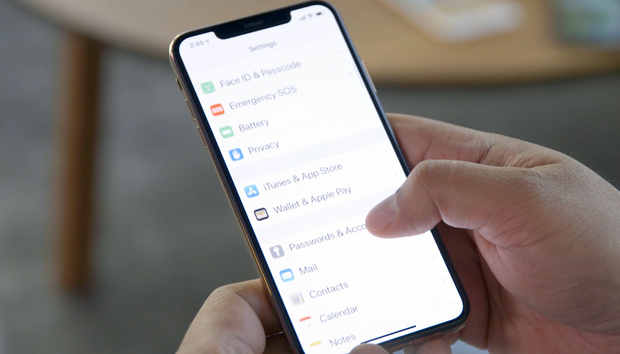 Within a week of its initial release, iOS 12 was already powering 30.21% iDevices, according to Apple. 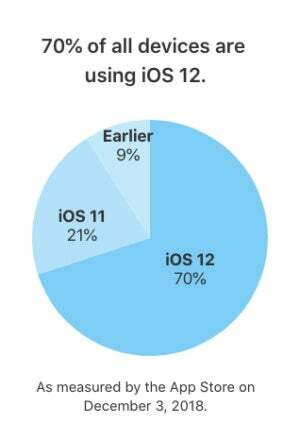 While that uptake rate may seem fast, it was far slower than last year's iOS 10 or 2015's iOS 9, which achieved the fastest uptake to date. 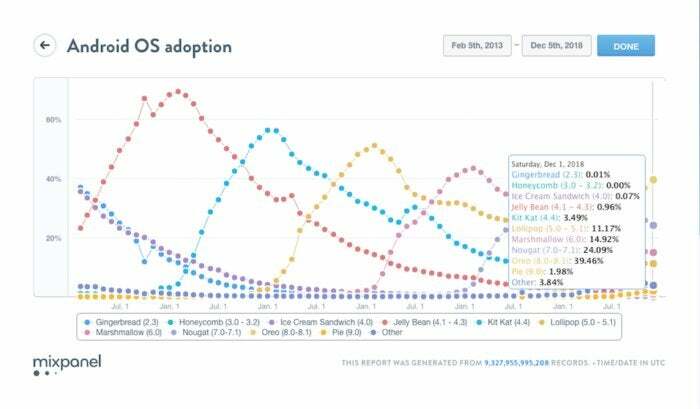 iOS 12's adoption rate is much faster than was the case for iOS 11 in 2017. According to business analytics service Mixpanel's data , adoption of iOS 11 surpassed iOS 10 on Oct. 10. 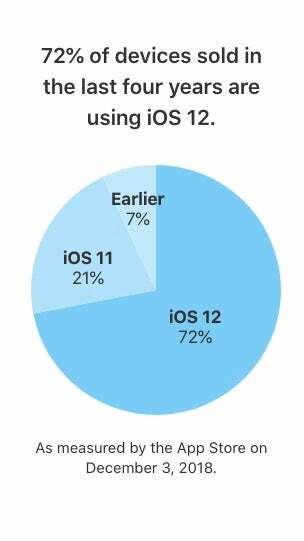 Today, Mixpanel’s data shows iOS 11 is being used on 71.3% of devices, while iOS 10 is being used on about 21.7% of them. 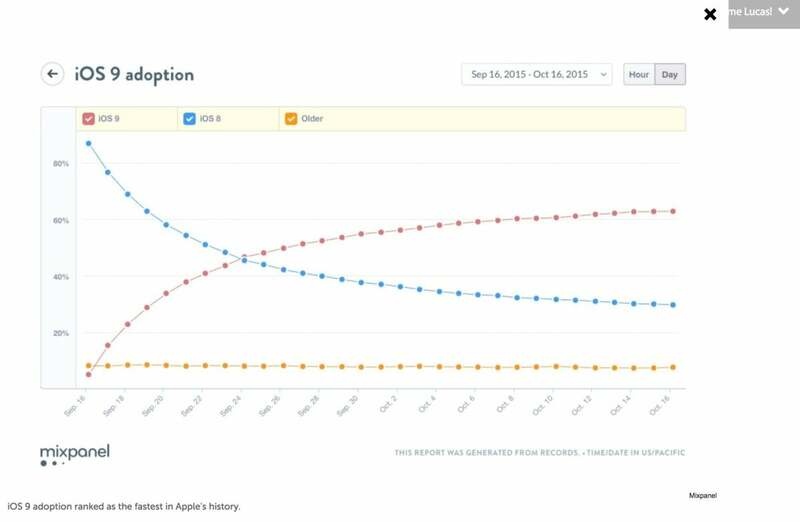 While iOS 11's uptake may seem like a steep trajectory, the iOS 9 uptake rate far outpaced it; that adoption curve remains the fastest in the history of Apple, according to the company. Launched on launched Sept. 16, 2015, it took just eight days for iOS 9 to surpass iOS 8; in 10 days, it garnered 50% of the install base. 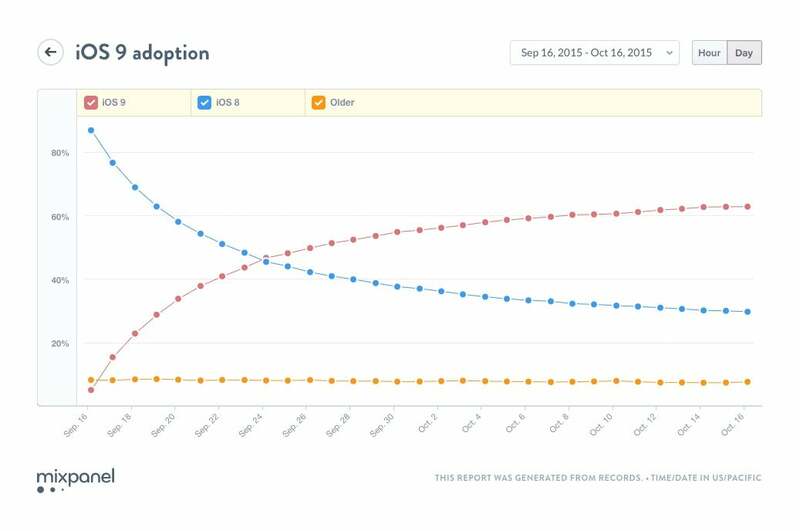 And a month after its release, iOS 9 was on 62% of the install base compared to iOS 8, which plummeted to just 29.65%. 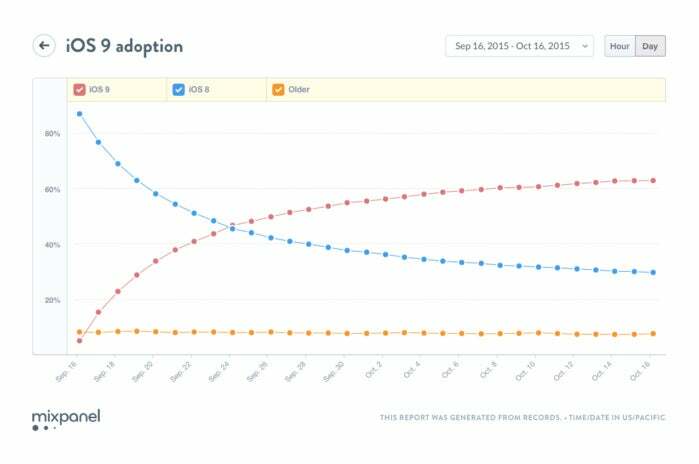 iOS 9 adoption ranked as the fastest in Apple's history. "iOS 9 is also off to an amazing start, on pace to be downloaded by more users than any other software release in Apple's history," Philip Schiller, Apple's senior vice president of Worldwide Marketing, said in a statement at the time. According to Mixpanel, iOS 9 had been installed on nearly 37% of devices just five days after its launch, even before the iPhone 6 and 6S officially arrived. One thing that might have slowed early adoption rates this year: Apple introduced two different iPhones in September – the iPhone 8 and 8 Plus, which were available late in September, and the iPhone X, which went on salel Nov. 3. Would-be iPhone X buyers may have skipped their iOS 11 upgrade, knowing they'd get it on the new phone. In 2014, iOS 8 saw just 16% uptake during the same period, while iOS 7 was on about 20% of devices running the platform five days after launch in 2013. In contrast, Google released Android 8 "Oreo" on Aug. 21, 2017; it had been installed on a 14% of devices over the first 14 months since its release. Version 8.1, released in December 2017 had installed on 7.5% of devices as of Oct. 26, 2018. Combined, those versions of Oreo are running on 39% of all Android devices. 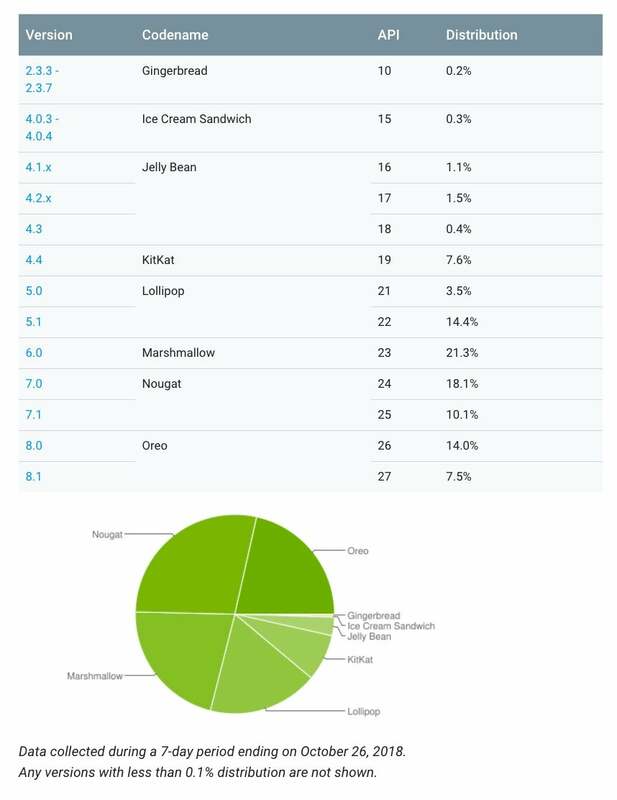 Android 6.0 (Marshmallow) and Android 7.0/7.1 (Nougat) were deployed on 21.3% and 28.2% of devices, respectively, according to the most recent data released by Google. Those numbers point to the more fragmented nature of the Android OS ecosystem, a point of continual debate by users of the rival systems. Android 8 adoption rate as of Oct. 26, 2018. Jack E. Gold, principal analyst for J. Gold Associates, said low Android uptake is typical because of the plethora of hardware versions available in the market. "New versions of Android are generally not forced on users and devices like a new version of iOS [is]," Gold said. "In fact, many older Android devices stay in play for years and are not even able to be upgraded to the latest version. Generally, no matter which version, it is usually only 10%-20% of devices that have the new version in the first 6-12 months, with many older versions still in users' hands." Because Google can't force mobile carriers to deploy new versions of Android, slow uptake rates aren't unusual. That sluggish adoption curve has raised concerns about security, but most device makers say the added time allows them to offer the most adaptable strategy to hit all device price points from low to high end. That's something Apple doesn't really do as much, according to Gold. While Android OS and Apple iOS make up nearly 94% of smartphone operating systems, Android is by far the dominant one for smartphones, capturing 73% of the smartphone market. More than 1.8 billion smartphone owners used Android phones in 2016, according to Forrester Research. Android is expected to maintain that lead, with more than 74% market share through 2017, followed by Apple (21%) and Windows Phone (4%).